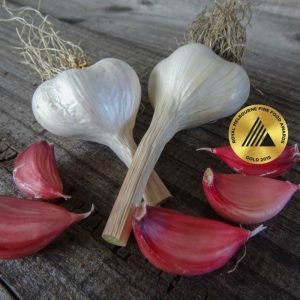 The Silverskin group is a softneck garlic and the longest storing of all garlics with more than 12 months. 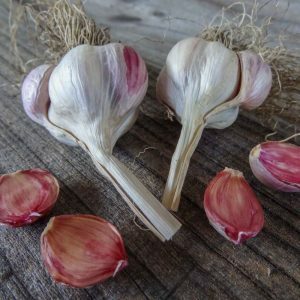 It is characterised by cultivars that can be overly strong but also cultivars with incredible fine spicy, complex flavours – so look carefully for the right silverskin so you can enjoy the best of them. 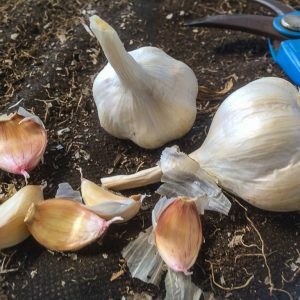 This garlic group is a late season harvester with a bulb that continues to mature are after the plant has leaned over to the ground. Often harvested too early and needs at least 3 weeks after it leans over for full bulb size to develop. 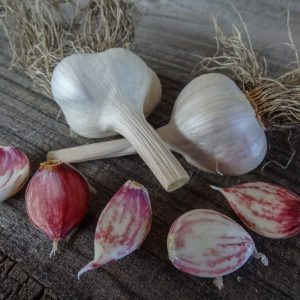 Whilst it is a softneck, it has the other unusual characteristic of being able to both produce a scape and pseudostem bulbils when it is stressed – further confusing novice growers. 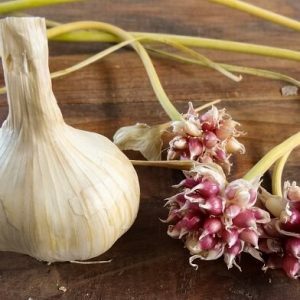 The best of the Silverskins are exquisite cooking garlics and even better when dehydrated. A great addition to a backyard garden. Bulb Shape: Oblong to 3 layered flattened round shape. Bulb Skin: Brilliant white, tissue-like thin skins. Cloves Number: 9-25 cloves in three layers where the outer layer is largest with a flat edged wedge shape with progressively smaller cloves in inner and middle layer. Clove colours vary from white, cream and hot pink. Bulbils: None usually. In stress 5-30 in scape and 2-3 in pseudostem. Scape shape: None usually. In stress downward bend. Growing: Develops 4-5 leaves before winter dormancy, and wants warm spring and warm summer to allow it mature. A tall strong plant with large 4-5cm separations between leaf pairs. Mid-green leaf colour. 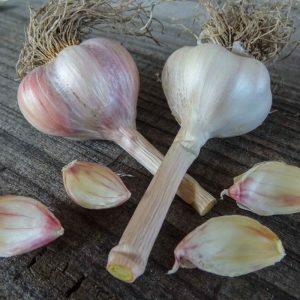 Harvest: Harvest at 6 green leaves in cooler, moist or humid soil conditions to maintain bulb skins, however in hot dry areas, plants can be left until almost fully dead before harvesting.